Because we need a mental break from the election. 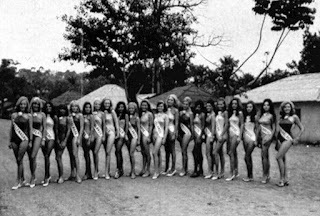 Due to the student uprisings, the 1968 Miss Europe contest was moved from Nice, France, to Kinshasa. Congo. There's an informative write-up here, and some silent video here. Interestingly, whoever wrote up the archival material for the video assumed the contest had to have been held in Belgium, in spite of all the African faces in the crowds! Not that Congolese ever lacked for beautiful women among their own. Jean Depara (1928-1997) was an Angolan immigré to Congo who became a photographer after buying a small Adox camera to record his own wedding. 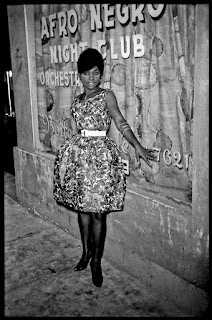 His collection of photos of Kinshasa, particularly its night life, are a striking memorialization of Kinshasa, la Belle. Maison Revue Noire in Paris is hosting a retrospective of his work until December 17.